The Gandhi clan has been ruling India for quite some time now. Gandhi’s came into power when Jawahar Lal Nehru was elected as the first Prime Minister of India in 1947. Since his victory, the Gandhi family produced leaders for India year after year. Nehru’s daughter, Indira Gandhi was also the prime minister of India as was her son, Rajiv Gandhi. Now her daughter in law Sonia Gandhi is the President of the Indian National Congress. She has also rules the current political party, United Progressive Alliance, which is in power in 2010.Her son Rahul Gandhi could take her place soon as the leader of Congress and the Prime Minister of the country if Congress emerges victorious in the Lok Sabha elections to be held in 2014. 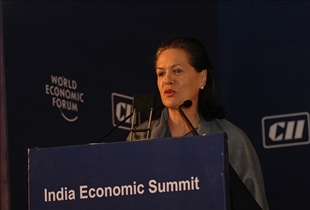 Although Sonia Gandhi is now an Indian resident, she was born in Italy on December 9th, 1946. She is the daughter of Stefano Maino and his wife Paola. She is a Roman Catholic and met her husband Rajiv at a Greek restaurant. Sonia came to India in 1968 after marrying Rajiv. Rahul Gandhi was born in India on June 19th , 1970. Sonia never achieved the same high level of education as her husband and son have. She attended a Catholic school and went to Cambridge in 1964 to study English at theBell Educational Trust's language school. Sonia also was never in the public eye when her husband was the Prime Minister of India. Although Rajiv was the elder son of the Gandhi family, he had no plans to enter politics and worked as an airline pilot, but he was pressured into changing his career and entered the world of politics in 1982 when his brother Sanjay Gandhi met his demise accidentally in a plane crash on June 23rd,1980. Sonia was not hounded by press unlike her son who has been in the news consistently. She only came into public scrutiny upon the shocking death of her husband Rajiv Gandhi in 1991. Rahul had no plans to join politics just like his father. He holds an Mphil degree in development studies from Trinity College, Cambridge where his father also studied. He has also worked as a professional for three years with the Monitor Group which is the management consulting firm of Michael Porter. He never disclosed his identity while working there and worked under the assumed name of Raul Vinci. He came back to India with plans of starting a technology outsourcing enterprise in Mumbai.Sonia Gandhi has been the MP of Rae Bareilly in United Pradesh since 2004 and won the most recent nomination in 2009. 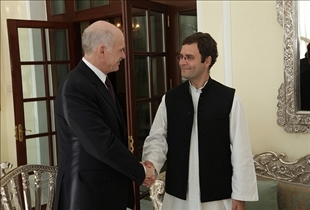 Rahul, on the other hand, has been an MP of Amethi in Uttar Pradesh for the last two terms. -Sonia’s not been very popular in India. Her decision to refuse the post of Prime Minister in 2004 was praised by many. Rahul has a chance to be elected Prime Minister in the near future. -Sonia’s unpopularity also has to do something with her being a female. India is a male dominated country where people want a male as the Prime Minister. -Both Sonia and Rahul live austere lifestyles. Rahul refused a seat as a Cabinet Minister in 2009. His decision reflects his mother’s leanings and decision to not seek to be the Prime Minister in 2004 and instead offering her seat to Dr. Manmohan Singh. neither - both are cheats and pretenders Sonia only got another minority - the Silkhs - on her side, and Rahul is doing same with Dalits, doing a double act of conversions and dividing Indian voters. They are setting in motion the Chrisitianisation of Indian society in a *massive* scale - take care India - there are *moles* in your midst!